You may already be aware that driving is a dangerous activity. Considering the number of car accidents that occur on a daily basis across the United States, you may even say that you put your own life (and the lives of your passengers) at risk every time you get behind the wheel. But why? What makes driving so dangerous? The answer may surprise you. Although it would be inaccurate to say that every car accident is caused by the same thing, similarities can be found throughout severe collisions that can help to determine risks factors. As such, the National Highway Traffic Safety Administration set out to determine what risk factors are commonly associated with severe accidents. Their findings are not only alarming but extremely sad. 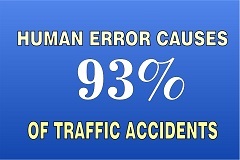 According to the NHTSA’s National Motor Vehicle Crash Causation Survey, 93 percent of all traffic accidents are a direct result of human error while only seven percent are caused by situational factors. Basically, if you’re not paying attention to the road, obeying traffic laws, and driving defensively, you could potentially cause a serious accident and become one of the many liable drivers who contribute to the 93 percent of human error accidents. Although the human element of driving is a serious concern in which you need to be constantly aware, situational factors can also play a significant role in causing risk. When you suffer a collision you undoubtedly want someone to blame for your injuries. However, in some cases, specific circumstances and situations—such as the time of day and weather conditions—are the cause. The Texas Department of Transportation (DOT) is launching a new campaign called “Drive to Conditions.” Its purpose is to encourage Texas drivers to adapt their driving behaviors according to the various road, weather, and traffic conditions they may encounter across our more than 79,000 miles of roadways. DOT reports suggest that by analyzing certain factors and learning when to stay off the roads (or at least when to be more alert) can drastically decrease situational car accident injuries. Time period risks. Certain times of day, days of the week, and months have been shown to be more dangerous than others. Visibility issues from the rising or setting sun, lack of light, and changes in traffic patterns can all have an affect on driving. As such, early morning rush hour (6:30 a.m. to 7:30 a.m.), overnight hours (2 a.m. to 4 a.m.), and evening rush hours (5 p.m. to 7 p.m.) see more accidents than other times. The most fatal crashes occur on Saturdays, while the most non-fatal crashes occur on Fridays. Crashes are fairly steady through the months, but months that have popular “drinking holidays” (St. Patrick’s Day, New Year, Christmas) have an increase of both fatal and non-fatal accidents. If possible, avoid driving in congested areas during these periods. If you must drive at these times, pay extra attention to drivers, traffic patterns, and visibility. Weather risks. Although Texas isn’t prone to a lot of snowfall, we do see our fair share of rain. Heavy rain, flooding, and mud can drastically increase your chance of an accident due to poor visibility, hydroplaning, and sliding. Be cautious when traveling through flood-prone areas. Flash floods can come rapidly and within minutes or hours of excessive rainfall. Turn on your head lights and slow down, allowing extra distance for braking and never attempt to drive through a flooded roadway. The water can be hiding dangerous conditions and even in shallow water (less than two feet), tires can become flotation devices and cause a 3,000-pound car to float downstream. The Texas DOT has an interactive website where you can check road conditions before leaving home, including where you’ll find accidents, closures, construction and various types of weather. You can also find more tips for driving in various conditions. Be sure to share this article with your friends and family so they can benefit from knowing when and how to stay safe on the road. To protect yourself even further, put attorney Steve Lee’s number (713-921-4171 and toll-free 800-232-3711) in your phone right now. That way you won’t waste time being stuck out in the rain when you need a helping hand. When you’ve suffered an accident, we’ll only be a quick dial away. What are the common causes of car accidents in rural areas? Post a Comment to "Contributing Factors for Car Accidents You Need to Know"